Hi! I'm Big Dave. Am I really big? You bet! I'm probably the biggest Dave you're ever likely to come across here on the web. In fact, I'm 6'8" (203 cm) tall and I weigh just about 290 pounds (132 kg). I used to be bigger but my hair fell out. Big Dave is also an Olde Farte, but not one of the dreaded baby boomers, having been born in 1943. I was big when big wasn't cool. It has been reported by reliable sources that the image at the left resembles me to a significant degree. If you're here looking for Heath/Zenith product support, click here. I am an Electronic Engineer. I graduated from the Pomona branch of Cal Poly (California State Polytechnic College, now University) in 1965 with a BSEL degree. My orientation at that time was electronic communications, especially radio. I have been a registered professional engineer (PE) in the state of Washington since 1972. My first job out of college was with Page Communications Engineers as a Site Engineer at an Army radio station located in the Midway Islands. My next job was with the Boeing Commercial Airplane Company in the Flight Test Instrumentation Research and Development group. I spent 18 years there, rising to Senior Specialist Engineer and slowly going nuts. My first assignments involved radio telemetry systems shifting to microcomputer based instrumentation in the early seventies. I escaped from Boeing in 1985. My next job was at FBE Research Company, Inc. , where I was the president and everything else. I was the only full-time employee! FBE was most recently a manufacturer and purveyor of enhancements and modifications for Heath and Zenith computers. Alas, Heathkit is kaput and Zenith went into commodity computers and was sold to Group Bull, a big French computer company. All of FBE's products are now obsolete. FBE's kaput, too. For the story of FBE, click here. In the early seventies, I discovered computers. The only computers that I was aware of at the time were mystical things kept in air conditioned glass caves and attended by snobby priests and acolytes. Then I saw the computer that changed my life. It was a Rolm 1602 airborne qualified minicomputer. It was just sitting on a workbench in our lab at Boeing. It was about a foot wide and high and about two feet long. It was connected to a Model 33 Teletype machine and was running Basic. I learned enought to write my first program (in Basic) that day. Having discovered Personal Computing, I wanted my own computer. Being a typical engineer, I proceeded in a methodical manner. I took a class at Boeing in assembly language programming. The class was taught on a Digital Equipment Corporation (DEC) PDP-8 and I found one in our "neighborhood" that I could practice on. Next, I designed and built a "glass teletype" terminal. It was capable of displaying 16 rows of 32 characters (later upgraded to 64 characters) on a television set. Finally, in March 1973, I bought a used DEC PDP-8/S, "the first minicomputer under $10,000," for $1,200 from American Used Computer of Boston. I was the first kid on my block to have a PC! The PDP-8/S (serial number 137) was built from small plug-in circuit cards using transistor and diode logic circuits. The logic levels were 0 and -3 volts. It had 4k of 12-bit words of core memory. Processing was bit by bit serial (that's what the S stood for) and it took 36 microseconds to add two 12-bit numbers. It had a bunch of switches and flashing lights on the front panel and came with a pile of software on punched paper tape. Other than my terminal, I had no I/O equipment. By careful shopping of the surplus market, I was able to outfit my 8/S with a paper tape punch and reader and a Model 28 Teletype for a printer. I designed and built the interfaces myself. The printer interface used a National Semiconductor SC/MP microprocessor to convert the parallel ASCII bytes from the computer to serial Baudot codes for the teletype. Cheap dot-matrix printers didn't exist at the time. At the left is a picture of part of my PDP-8/S system. The computer is the bottom unit with the paper tape reader just above it. The terminal and interface logic circuitry is on the top. Not shown is a high speed (120 bytes per second!) paper tape punch and a couple of power supplies for the computer and logic. The rack is 19" wide. In 1976 I replaced the 8/S with a used PDP-8/I which used the same style of plug-in circuit cards but now with TTL integrated circuit logic. Logic levels 0 and +3 volts. The 8I could add two 12-bit numbers in 3 microseconds. It had 4k of 12-bit words of core to which I added 4k words of 2102 semiconductor RAM cleverly disguised to look like a standard 4k core module. I later added a used DF32 hard disk system (64k words on two huge disk platters with fixed heads) and a single DECtape drive and ran the OS/8 operating system off of the hard disk. At the left is a picture of what's left of the PDP-8/I system. The computer is at the bottom with most of it not visible below the picture. 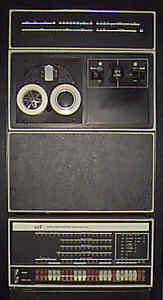 The blank panel above the computer hides the control logic for the DECtape, above. At the top is the DECtape status panel with lots of flashing lights. Don't you miss 'em? Always loved them flashing lights. Introduced in 1965, the PDP-8 was DEC's first production minicomputer. Its minimum configuration sold for under $20,000. The PDP-8/S appeared in 1966 and the PDP-8/I in 1968. The series ended in 1972 with the PDP-8/F. There were numerous variations and derivative models over the years. All together, over 30,000 PDP-8 series machines were produced. Compare this list with the instruction set of a 386! Even so, as with any general purpose computer, the PDP-8 could be programmed to do most anything. It just took longer to execute. Sometimes so long that it wasn't practical. By 1977 I was up to my eyebrows in microcomputing at Boeing and decided to put together a system at home. I did this using S-100-bus cards purchased from various suppliers advertising in the computer magazines of the day. I built my own case, S-100 bus and I/O card. This system had/has a Wameco 8080 CPU card, 32k bytes Godbout CompuKit RAM, a Tarbell disk controller with two huge 8" floppy drives (256k each) and ran Digital Research's CP/M v1.4 operating system. CP/M bore a certain resemblance to OS/8 which I used to run on my PDP-8/I. Have you ever heard of any of this stuff? In 1979 the Heath Company introduced the H-89 All-In-One computer as a kit. It looked like a terminal with a keyboard and a 12" CRT (it was based on their H-19 terminal) but it also had a 5¼" floppy disk drive (100k) and Z-80 CPU with 48k of RAM. It ran HDOS, Heath's proprietary disk operating system, and later, CP/M, the "universal" operating system of the day. It was just what all of us Apple-hating engineers were looking for. Early in 1980, three of us at Boeing bought H-89 kits and put them together. Towards the end of 1980 we bought Centronics model 737 printers and needed a way to hook them up. I designed a simple parallel printer interface and my company, FBE Research, established in 1975, began manufacturing them. In 1983 I got a Zenith Z-120 through a Boeing Computer Club group purchase deal. The Z-120 was an all-in-one style machine with an 8088 CPU for running ZDOS (MS-DOS 1.0 in disguise) and an 8085 CPU for running CP/M. It was the ideal transition machine since we were all running CP/M at the time. 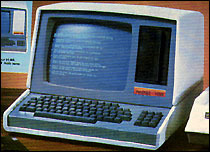 The Z-100 series was also available as a Heathkit (replace the "Z" with an "H") since Zenith had bought out Heath to get their computer expertise. I designed a couple of products for the Z-100 series, one of which got me out of Boeing and was sold via the Heathkit catalog and through their nationwide chain of 60+ stores. By now I was firmly on the Heath/Zenith track. Zenith's first PC compatible, the Z-150, came out in 1984 as the first model of the Z-100 PC series. I bought the H-151 kit version in December 1984 and developed a few products for it. As time went by, I made products for the H/Z-148 desktop, H/Z-161 luggable H/Z-151, Z-171 lunchbox-style portable (originally the Morrow Pivot, bought by Zenith to fulfill a government contract) and the EaZy-PC "home" computer. In 1988 when I got an H-248, an AT clone with an 80286 CPU, I couldn't find anything it needed that I couldn't easily get elsewhere so the sequence of products ended. I later (1990) upgraded the H-248 to an H-386/25 using a Heathkit upgrade kit. Heath got out of the kit business in 1992. The next computer, a 486DX2/50 by Gateway 2000, arrived in 1992. In the summer of 1995, I got a P5-120, also by Gateway 2000, to run Windows 95. Then a Dell Latitude LM P100 notebook on the day after Christmas in 1996. In September of 1997, I "built" the "project P9709" computer from parts. It has an ASUS P2L97 motherboard with a 266 MHz. Pentium II CPU in an Enlight ATX mid-tower case. In December 1997, as project P9912, the old Gateway 486 box got a new motherboard, an ASUS TX97 with an Intel 233 MHz. Pentium MMX CPU. Later in December, the P9712A box was put together. Its also an ASUS TX97 motherboard in an Enlight mini-tower case but with a 233 MHz. AMD K6 CPU. I liked the mini-tower case so much that in April 1998 I transplanted P9912 into one, getting rid of the giant Gateway desktop case. The original Gateway 486 was "reconstituted" and put on the shelf. In November of 1997, I joined the distributed.net effort and put the Gateway P5-120 and the P9712, P9712A, and P9709 boxes to work 24 hours a day checking keys. The P5-120 also acts as the proxy key server for my little local network. I threw out my three H89's and related disks, documentation and software during the great cleanup (1.96 tons to the dump) of 1992. I later regreted this. I should've kept one H89 system. Its like a gap in my memory. Then, in April 1998, an H89 that I built for a friend at Boeing in 1980 came back to roost. It works fine but is it ever slow! This H89 has two 40-track single-sided single-density 5¼" floppies (one internal and one external) and 64k of RAM (expanded from 48k with a 16K FBE H89RAM card). It runs CP/M v2.2 and HDOS v1.6. Hot stuff in 1980! In the summer of 1998, I installed the Red Hat 5.1 distribution of Linux on the P9712 box and everything changed. Since then, I have had OS angst. Upgraded to Red Hat 6.1 with a firewall after being rooted in March of 2000. Also added a second network card to share the DSL connection on the LAN via IP Masquerading. Linux is good! In January of 1999, a friend who had gotten a new computer for Christmas gave me his old Gateway 486 box. It had been re-motherboarded once but was now dead. As project P9901, I put in an Amptron PM-9100 motherboard with a 300 MHz. AMD CPU and installed Linux. Total cost: less than $200. Amazing! In March of 1999 I got Covad DSL for my internet connection and was motivated to do something with it. The answer was a webcam. I wrote the software and built the P9903 box to act as a server for the camera pictures. Its an ASUS P5A-B motherboard with an AMD K6-2 400 MHz. CPU. Running Windows 98 so as to support the USB cam. Just before the end of the 1999, along came the P9912 box with an ASUS P2B-B motherboard with an Intel Pentium III 600 MHz CPU running the Red Hat 6.1 distro of Linux. This is the fourth AT mini-tower box and will be the last. There are no more slots on my AT-style KVM switch box. For no good reason and to get my distributed.net key rate up, in May of 2000 I built the P9A05 (after 99 comes 9A, right?) box using an ASUS P3B-F ATX mainboard with an Intel Pentium III CPU (550 Mhz.) and 64 megs of PC100 RAM. Nothing else but an old VGA card, a floppy disk drive and a network card. Runs a version of Linux produced by Tom that fits on a single floppy disk. Upgraded in September of 2000 to Computer First Class by the addition of a decent video card, a CD drive, a big hard drive and a sound card. Now runs the Mandrake 7.0 distro of Linux. In August of 2000, the long awaited new main box came to life as P9A08. This one has an ASUS CUSL2 ATX motherboard with an Intel Pentium III 800EB CPU, 256 MB of PC133 RAM and runs Windows 98SE. A new computer table was aquired and furniture was rearranged to let the new box and friends (P9A05 and P9709) share a keyboard, monitor and mouse via a 4-slot ATX-style KVM switch. The new box has two network cards, one connected to the LAN and the other to the Internet via a cable modem. AT&T finally made @Home available in my area in July of 2000. July 2005 My goodness! It's been five years since I updated this page. Perhaps that's because computers have become kind of dull? Sad, but true. The uses are more interesting than the hardware. Still, there have been some changes. The P9A11 box was built in November 2000 to kick up my distributed.net key rate. It has a pair of AMD Athlon 1800MPs and runs Linux. The P9B11 was built in November 2001 for my wife to use. It uses a small form factor case and motherboard with a 1000 MHz. P3. It runs a SuSE distro of Linux. The P9C08 box was built in August 2002 for video work. It has an AMD 1800XP and runs Windows 98SE. The P9A08 box got a new motherboard with a 2400 MHz. P4 in December 2002 because it wouldn't work with a new tape drive. In February 2004, the motherboard in the P9709 box failed and was replaced with the one pulled from the P9A08 box. It's still runing Windows 95 OSR, but at 800 MHz. now. In May 2005, I bought a barebones box from Computer Sonics. They even isntalled a hard drive and CD ROM for me. I added a network card and installed Windows XP SP2. It's used for a portable music player whose software wouldn't work with Windows 98 SE even though it was supposed to. It has an AMD Duron 1800 CPU. The P9712 and P9903 boxes have been retired. By January 2001, the Dell Latitude LM P100 notebook (1996) was beginning to get a bit out of date. It was replaced with another Dell Latitude, this time a CPtS600GT. In July 2001, in a fit of insanity brought on by watching The ScreenSavers too much, I bought an Apple 12" G3 iBook, a wireless card and an Airport. A very weird computer! OS9. No task bar. One mouse button (in a year or so, I learned how to control-click). But, I could wander the property and surf the web wirelessly. That was very nice! By early 2004, the new Dell CPtS600GT had become possessed by a demon. The hard drive had failed, a hinge broke and it was crashing frequently. I branded it as unreliable and began looking for a replacement. Not another Dell, that's for sure! The older Dell had also lost a hard drive early on. No demons though. The new Dell was crashing so often it was unusable. I started using the little iBook on a daily basis. I noticed how solidly it was built compared to the "floppy" Dells. Hmmm. After a few weeks, it occurred to be that the little iBook had been chugging along trouble-free for years. So, I bought a 14" G4 iBook in March 2004. It runs OSX which turned out to be a joy. It's based on Linux (well, BSD), you see. I can pop open a terminal window and feel right at home, all warm and fuzzy. It's got a dock like KDE. Still only one mouse button though. But, Apples are now acceptable! Isn't that something? This week, I ordered a Mac Mini (July 2005). It will replace the P9B11 box which will be retired. Much desk space will be recovered. My wife will appreciate that. July 2010 Well, another five years have passed. Time for an update. Computers are still dull. Apps are good. We are a Mac house now. The PCs are all gone. More about that later. In July 2006, I bought a second Mac Mini, an Intel CPU this time, for use experimentally in the basement with a 37" Sceptre LCD TV I got at Costco. It worked just fine and is now in the living room connected to a 52" Samsung. The Sceptre was sold on eBay in 2009. In April 2007, the G4 iBook acquired a demon and wouldn't reliably boot. It was replaced promptly with a 14" 1.83 GHz. MacBook Intel Core Duo with a 60 GB drive and 1 GB of memory. I pulled the hard drive, put it in a USB case and migrated easily to the new machine. It wasn't until some time later that I learned about Target Disk Mode. The G4 was sold on eBay, for parts, minus the drive, in 2008. By this time, I had capitulated to Steve's Way and began to move from PCs to Macs. Also in April 2007, I bought a nice Mac Pro with two 2.66 GHz. Intel Xeon Dual Core CPUs, two 500 GB drives and 4 GB of memory for the basement. I started migrating functions and killing off PCs. A bit over a year later, the job was done. Late in 2009, fourteen PCs (and related gear) were taken to the recyclers. The Mac Pro now does it all including running a few old Windows 98 apps under VMWare. In January 2008, the lure of the new iMacs became too strong to resist. I bought a 20" 2.66 GHz. Intel Core 2 Duo with a 320 GB drive and 2 GB of memory for my wife, replacing the G4 Mac Mini from 2005. That machine was sold on eBay in 2009. By March 2008, after 7 years of Eric's Ultimate Solitaire and light web browsing, the original G3 iBook developed some screen problems. It was sold on eBay in 2008. The new owner fixed it and was happy. When the MacBook Air came out in 2008, I couldn't resist and got one in April for use in the living room. I bought the "cheap" one. The MacBook Core Duo took over the "light duty" job vacated by the G3 iBook's demise. If you've lost count, that's a total of five Macs in house. But wait, other Apple gadgets have also moved in as well. There's an iPhone (2007) and, this year, an iPad. Do these count as computers? What's next? Who knows? But, isn't it amazing how far computers and software have come since I started out?